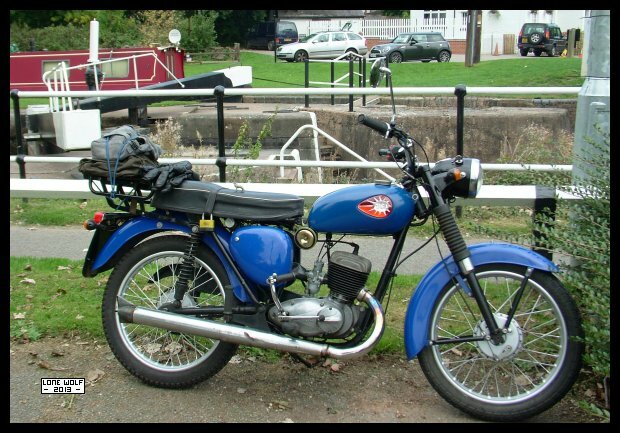 The Bantam having a rest at Hatton Locks before heading for the Ace Cafe in London. Monday saw me fitting better mounting bolts to the Bantam's rear sprocket. Spent a few days fettling the hand change for the MZ - it moved under its own power for the first time this week. Saturday and I set off on the Bantam, bound for the Ace Cafe and their "Chicken Run" event. I got to Stokenchurch with no problems, found Chris's Cafe and then went back up the road to the cafe in the garden centre for dinner. pull and snap in my leg . . . . this is the "good" leg. One ambulance ride later and I'm booked in at Stoke Mandeville hospital, awaiting surgery on my right knee on Monday. So neither the Bantam or myself made it to the Ace Cafe this year. Thanks to Andy and Ian who came and rescued both me and the Bantam.